So you've decided that you want to run a B&B, and you're not sure how big or small it should be? Or have you fallen in love with a property and decided that running a B&B there would help you afford it? If it's the latter, then you're in danger, because running a successful B&B isn’t really something you can do on a whim. You need to decide what amount of effort and money you can put into it, and then make business decisions accordingly. Doing it the other way round doesn't necessarily mean it will fail, but you might be in for a rockier road than you thought. If you are calmly assessing the possibilities, your capabilities and the right market sector to enter into then you are more likely to end up with a property to match the business, rather than having to do it the other way round. 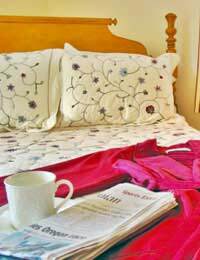 There is a general rule of thumb in the trade that three to five bedrooms is a comfortable range for a B&B run by a couple. Anything smaller means that the effort involved in keeping the rooms in good order and the cost of having a range of food available to cater for people's breakfast choices isn’t worth the return. It also means that you don't have the flexibility to cater for many people and might have to turn people away because you don't have the right mix of beds and rooms. This doesn't mean that you shouldn’t run a B&B with less than three rooms, you just need to be aware that it is more likely to be a hobby on the side rather than a real money earner. It would be folly to rely on the income from a smaller B&B and you should ensure that there are other income streams generating money to help you live, whether it's from other businesses, pensions or savings. Many ex-pats living in France or other countries do B&B using their spare bedrooms. This is often because they like to meet people from the United Kingdom occasionally although it does help to have the extra money. This can work well if you are in a tourist area. Or if you do not want to run a major business but are close to a major route for travellers, you can target the overnight stay market. Then you only get people for one night so it's not such an imposition, but if you make a good impression you will get repeat business for many years to come. Equally, going over the three to five room range doesn't mean that you can't run a B&B, it just means that the operation needs to move up a gear. You are likely to want to find staff to help out in the busy periods, because cleaning and changing eight or nine bedrooms every day will be too much work for one or two people. You will need to invest in more bed linen, have a larger dining room, lounge and car parking to cater for the extra people. Just as with a smaller property, there's no reason not to do it, you simply need to recognise that there will be higher costs, in time as well as money. This means approaching the project with a proper business plan. But the positive side of having a larger property is that you can make more money. Not only will you be able to fit more guests in, but you will have the flexibility to cater for a variety of guest numbers and build more of a business. You could focus on family gatherings or special interest groups, if there is something in the area that draws people to it. Sticking with the three to five bedroom rule works for most couples who want to make a reasonable income and not build a huge business. It might still be worthwhile employing someone to help with the cleaning and laundry in the busy season but generally you will be able to keep costs down by doing most of the work yourselves. Questionnaire: What is the Target Market for Your B & B? How Much Profit Can a B&B Make? Should I Offer Evening Meals at My B&B? Questionnaire: Are You the Right Person to Run a B&B? Hi! My partner and I in our 20s and 30s are looking to buy a b&b and wondering are some lenders better approached for finance than others in the north of England? We'll have a 25% deposit and will write a business plan.